The 1964 United States presidential election in Virginia took place on November 3, 1964. All fifty states and the District of Columbia were part of the 1964 United States presidential election. Virginia voters chose twelve electors to the Electoral College, which selected the president and vice president of the United States. 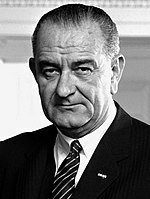 Virginia was won by incumbent President Lyndon B. Johnson of Texas with 53.54 percent of the vote, who was running against U.S. Senator Barry Goldwater of Arizona. Johnson also won the national election in a landslide with 61.05 percent of the vote. However, the state would not vote for another Democratic candidate until 2008. As of the 2016 presidential election[update], this remains the last occasion when Amherst County, Bland County, Clarke County, Culpeper County, Fauquier County, Frederick County, Rockingham County, Washington County and York County have voted for a Democratic presidential candidate. It is also the only time Waynesboro City has voted for a Democrat for president, whilst Prince William County and Winchester City would never vote Democratic again until 2008. Fairfax County, Virginia's most populous county, would not vote Democratic again until 2004, having last voted Democratic in 1940 before this election. The independent city of Virginia Beach has also not voted Democrat since.